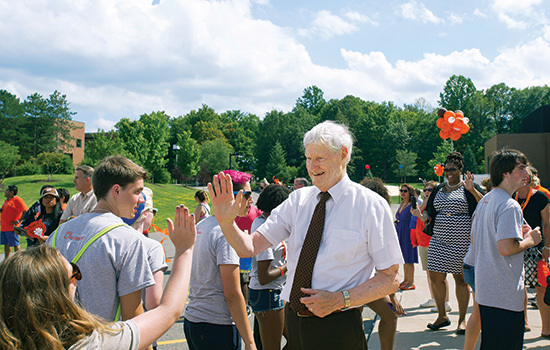 RIT President Bill Destler greets new students as they parade in the Tiger Walk. RIT welcomed a record number of freshmen this year. Total enrollment surpassed 18,600 students, an all-time high. RIT is on the cusp of greatness. Yet now more than ever we need you as our RIT ambassadors to spread the word of our accomplishments and growing reputation. We welcomed a record freshman class of nearly 3,000 students this fall and we now have the largest enrollment in our history. Selectivity continues to improve, diversity continues to enrich and geographic draw continues to widen across the U.S. and overseas. We also continue to emerge as a student-centered research university. Sponsored research funding is at an all-time high. Every measurable indicator for a university is up while our alumni are increasingly making us proud all over the world. RIT is the 10th largest private university in the nation in terms of full-time undergraduate enrollment that exceeds 15,400. With 3,200 graduate students, total enrollment surpasses 18,600. RIT is the second largest producer of undergraduate STEM (science, technology, math, engineering) degrees among all private universities in the nation. RIT is a world leader in experiential education. RIT has the fourth-oldest (1912) and one of the largest cooperative education programs in the world, annually placing more than 4,100 students in more than 6,100 co-op assignments with nearly 2,100 employers across the United States and overseas. RIT has top 10 national programs in the following areas: computing security, fine arts (glass, metal jewelry), industrial design, film and animation, online MBA, photography and video game design. RIT boasts award-winning programs in a host of uncommon disciplines—sustainability, medical illustration, microelectronic engineering, packaging science, museum studies, interpreting services and diagnostic medical sonography. RIT offers unique doctoral programs in astrophysics, color science, computing and information sciences, engineering, microsystems engineering, imaging science and sustainability. Several interdisciplinary doctoral programs are in the planning stages. RIT is a world leader in education and access for deaf and hard-of-hearing students. RIT is home to the National Technical Institute for the Deaf (NTID), the world’s first and largest technological college for students who are deaf or hard of hearing. President Lyndon Johnson and Congress established NTID in 1968. RIT’s sponsored research grew by 18 percent in fiscal year 2015, reaching a record $62 million in funding. RIT received 356 new awards from a variety of state, federal, corporate and foundation sponsors. Federal funding was at an all-time high with the National Science Foundation providing $13 million and the National Institutes of Health providing $3 million. Three RIT students won Fulbright Fellowships for the 2015-2016 academic year. RIT also had 40 international students from 25 countries attend the university this past year through the Fulbright Foreign Student Program. Two RIT students took a top prize in Microsoft’s U.S. Imagine Cup National Finals this year. RIT’s cyber defense team is a perennial powerhouse at the National Collegiate Cyber Defense Competition. In the past three years, they’ve taken home the gold, silver and bronze. The international student population at RIT has more than doubled over the past 10 years, driven by explosive enrollment in the university’s graduate programs. A record 2,497 international students from 103 countries chose to study at RIT this academic year. RIT also has partnerships with more than 60 nations and international campuses in Croatia (the cities of Dubrovnik and Zagreb), Dubai and Kosovo. Finally, our alumni—118,000 strong— continue to make us proud. They can be found in all 50 states and 123 countries. In 1983, RIT became the first university in the nation to offer a Bachelor of Science degree in biotechnology. RIT delivered its first fully online program in 1991 —years before the rest of higher education entered the online arena. The information technology program was the first nationally recognized IT degree, created in 1993. RIT was the first university to offer an undergraduate degree in software engineering in 1996. In 2002, RIT’s Kate Gleason College of Engineering launched the world’s first and only Ph.D. program in microsystems engineering. In 2008, RIT launched the first doctoral program to focus on sustainable production systems. In 2012, RIT was among the first universities to create a department dedicated to computing security.